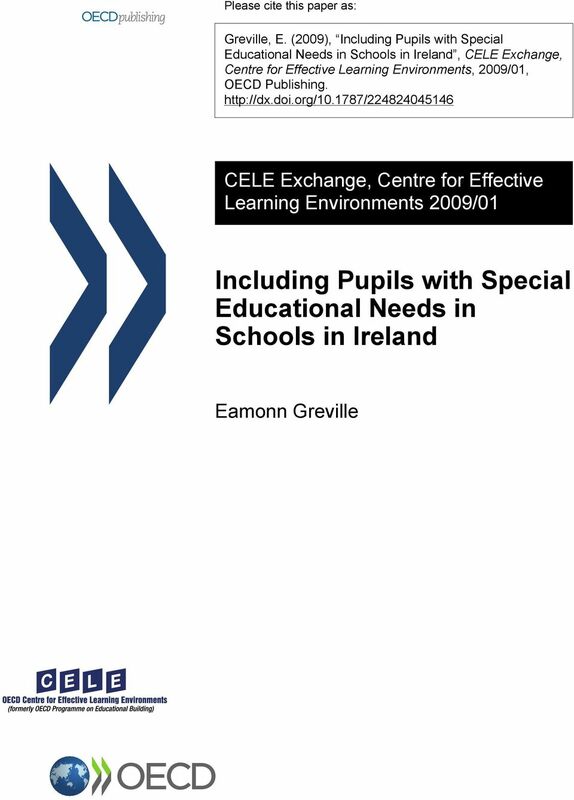 Download "Including Pupils with Special Educational Needs in Schools in Ireland"
2 ISSN Including Pupils with Special Educational Needs in Schools in Ireland CELE Exchange 2009/1 OECD 2009 Including Pupils with Special Educational Needs in Schools in Ireland By Eamonn Greville, Department of Education and Science, Ireland The Department of Education and Science in Ireland has recently drawn up a set of planning and design guidelines for learning spaces for pupils with special educational needs in mainstream primary and post primary schools. 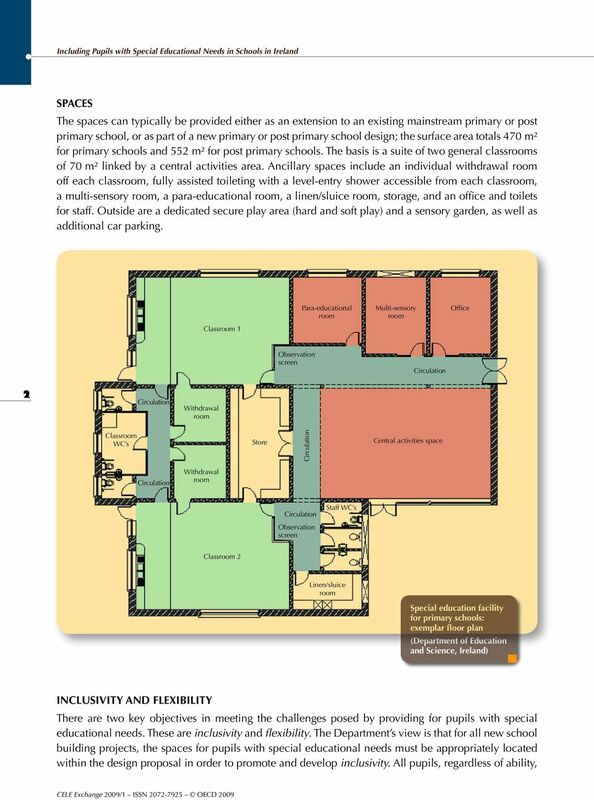 The document entitled Planning & Design Guidelines for Accommodation for Pupils with Special Educational Needs in Primary & Post Primary Schools (Technical Guidance Document 026) will shortly be published on the Department s website at These guidelines offer information on space planning and design for school principals, boards of management and designers to make permanent learning facilities available for pupils with special educational needs across the 26 counties of Ireland. 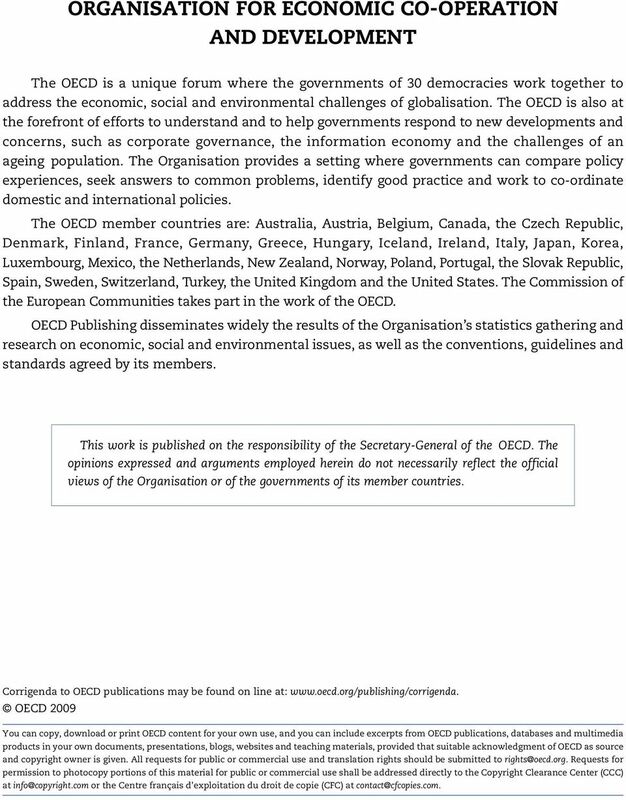 The guidelines reflect many of the recent changes in the country s educational system, changes that have placed greater demands on schools for additional space to account for a growing range of teaching and support services for pupils with autistic spectrum disorders, emotional disturbance and/or behaviour problems, speech and language difficulties, hearing impairment, visual impairment, multi-sensory impairment, and other needs. Background A number of mainstream schools, mainly at primary level, have been providing classs for pupils with special educational needs for some time, mainly in the area of autistic spectrum disorders; however the type and quality of physical infrastructure needed to deliver these classes has often been less than ideal. 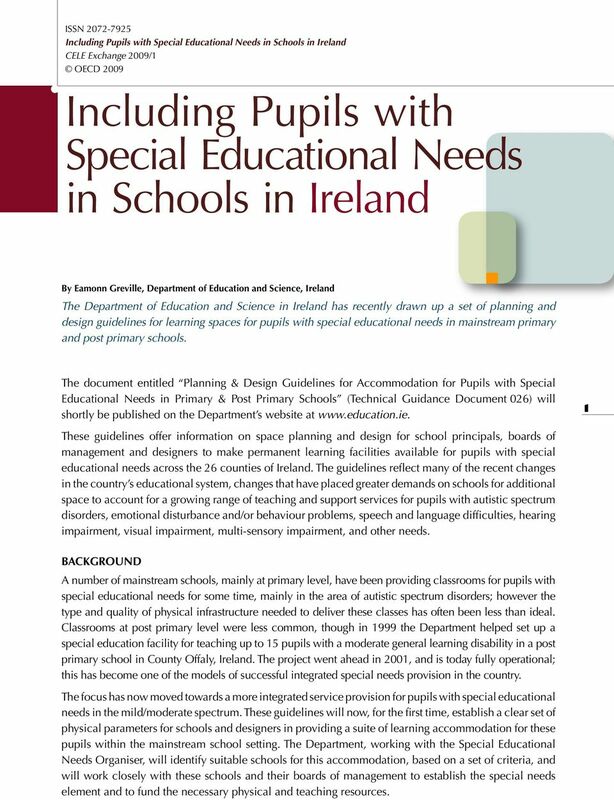 Classs at post primary level were less common, though in 1999 the Department helped set up a special education facility for teaching up to 15 pupils with a moderate general learning disability in a post primary school in County Offaly, Ireland. The project went ahead in 2001, and is today fully operational; this has become one of the models of successful integrated special needs provision in the country. The focus has now moved towards a more integrated service provision for pupils with special educational needs in the mild/moderate spectrum. 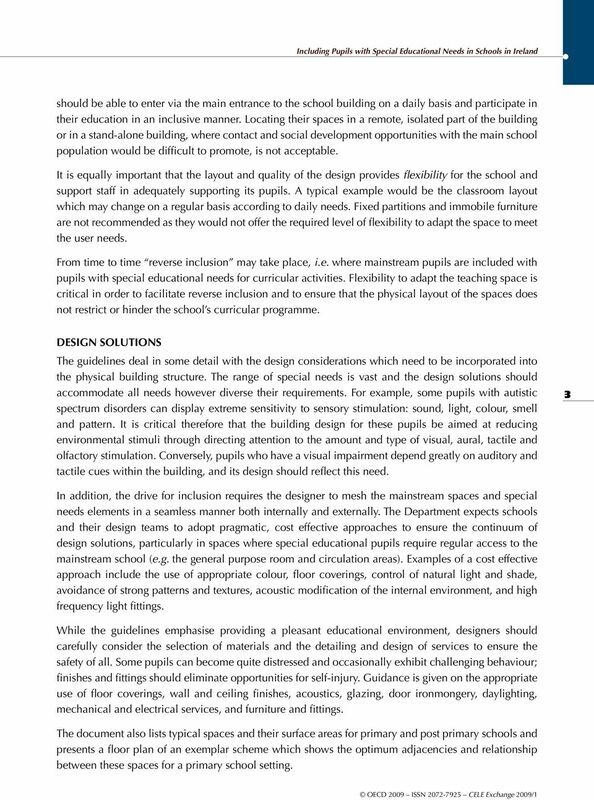 These guidelines will now, for the first time, establish a clear set of physical parameters for schools and designers in providing a suite of learning accommodation for these pupils within the mainstream school setting. 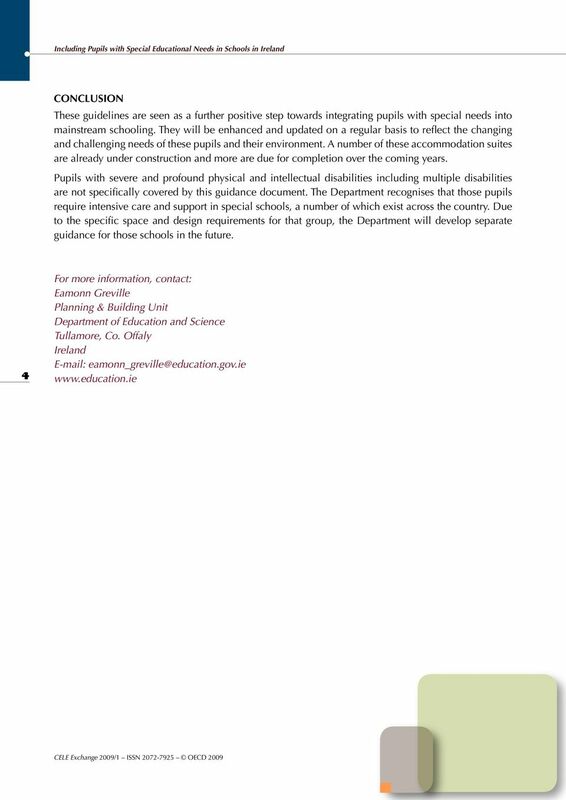 The Department, working with the Special Educational Needs Organiser, will identify suitable schools for this accommodation, based on a set of criteria, and will work closely with these schools and their boards of management to establish the special needs element and to fund the necessary physical and teaching resources.